The was a lot of talk late last year among animation fans about The Hub, a new cable channel created as a joint venture between Discovery Channel and the Hasbro toy company. The Hub was started as direct competition for the likes of The Family Channel. As such, they show original animated TV series during the day — almost entirely based on various Hasbro toy lines — an sit-com re-runs at night. One of the current flagships of the former is My Little Pony: Friendship is Magic, a flash animation series. It was developed for television by Lauren Faust, who is well-known in animation circles for her work on Powerpuff Girls and Foster’s Home for Imaginary Friends with her husband, Craig McCracken. Here’s the series description from Wikipedia: “The series stars a unicorn pony named Twilight Sparkle, who has been known to be a pupil of the world’s ruler Princess Celestia. Seeing the young pony buried in books, the princess gives her the task of making friends, sending her, and a young dragon named Spike, to Ponyville. There, they meet some interesting ponies, including tomboyish Rainbow Dash, glamorous Rarity, hard-working Applejack, timid Fluttershy, and hyperactive Pinkie Pie. Together, they explore the ins and outs of the town, solve various problems, and make even more friends. Every day is a lesson for Twilight, but none as important as the magic of friendship. At the end of each episode, Twilight relays a report to her mentor Celestia, telling her what friendship has taught her.” The series is animated by Studio B Productions in Vancouver, Canada. Word is slowly making the rounds that John Patrick Morgan — better known in fandom by his initials as J.P. Morgan — passed away from a heart condition at the end of December at the age of 53. J.P. was a cartoonist and illustrator for many years. His best known creation, the comic book series Fission Chicken, made him a star among the “funny animal” segment of furry fandom. Fission Chicken saw the light of day in funny animal fandom publications like Rowrbrazzle before being picked up by Fantagraphics Books. The Fission Chicken on-line story arc concluded in late December last year — a few days before Mr. Morgan passed away. His web site is still there, along with his Deviant Art site. An official obituary is also on line. This morning the Academy of Motion Picture Arts & Sciences announced the nominees for the 83rd annual Academy Awards (the “Oscars”), to be presented on Sunday, February 27th. As everyone expected, Disney Pixar’s Golden Globe-winning Toy Story 3 (the biggest world-wide money maker released in 2010) was nominated for Best Picture of the Year (which a lot of people are saying it will not win) and Best Animated Feature (which a lot of people are saying it will win). TS3 was also nominated for awards in the categories of Best Song (by Randy Newman, of course), Best Sound Editing, and… Best Adapted Screenplay?? It seems that the Academy considers a sequel film to be “adapted from a previous existing medium” because it uses previously created characters and settings. Or so we’ve been told. Fine. Dreamworks’ How to Train Your Dragon was also nominated for Best Animated Feature, as well as Best Original Score (by John Powell). Interestingly, the third slot for Best Animated Feature went to The Illusionist from France, whereas the Golden Globe Awards had chosen Sony’s Despicable Me. Other furry-themed pictures to watch include Tim Burton’s Alice in Wonderland from Disney, which was nominated in the categories of Best Makeup, Best Costume Design, Best Art Direction, and Best Visual Effects. Check out CinemaBlend.com for a complete listing of nominees. Of course, before the Oscars come the Annie Awards for animation on February 5th. It’s always interesting to see how the two groups of awards compare. Another in the “how’d we miss this?” category… The Gruffalo is an award-winning children’s book from the U.K., written by Julia Donaldson and illustrated by Axel Scheffler. It was first published in 1999 by Macmillan Children’s Books. It tells the tale (via a mother squirrel giving her children a bedtime story) of a mouse walking through the woods. When he is threatened in turn by a predatory fox, snake, and owl, he scares each of them off by telling them he is on his way to meet his friend the “Gruffalo” — a monstrous creature who is much more dangerous than any of them. 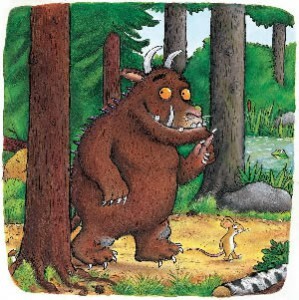 He’s making it all up, of course, and he thinks he’s so clever… until he runs into the real Gruffalo. After the book became enormously popular in the U.K. and elsewhere, Magic Light Pictures and Studio Soi made The Gruffalo into a 30-minute CGI film, which was broadcast on U.K. television for Christmas 2009. It featured (among others) the voices of Helena Bonham Carter (as the mother squirrel), John Hurt, and Robbie Coltrane (as the Gruffalo). The BBC has a trailer for the show on-line, and there’s also a making-of video from Magic Light. Cartoon Brew is reporting that Robert Downey Jr. has been tapped to play the voice of none other than Mr. Peabody in a new live action/CGI film from Dreamworks, Mr. Peabody and Sherman. 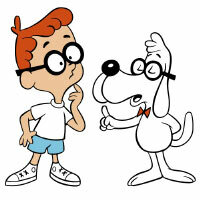 For you young folks who don’t know: Mr. Peabody is a genius-level talking dog, and Sherman is his loyal human boy assistant. The original animated cartoon was part of the Rocky & Bullwinkle cartoon series, animated by Jay Ward Productions. This new version is being written by Jeffrey Ventimilia and Joshua Sternin (from the recent Yogi Bear movie) and directed by Rob Minkoff (from The Lion King). There’s a wait to see how this turns out: The film isn’t due until 2014. More CGI news from across the Atlantic… French director Pascal Herold (The True Story of Puss ‘n’ Boots) is working on a new anthropomorphic version of the story of Cendrillon… known to the English-speaking world as Cinderella. Here’s a quick re-cap from Animation World Network: “Based on Charles Perrault’s novel, this Cinderella story is set in the American Wild West and follows a cute tomboy named Cinderella who loses a tooth during a fight with pirates at Prince Charming’s ball. The characters are humanoid animals.” Animation Magazine recently had a character portrait of the “cute tomboy” antelope who stars in the film. It’s set for release this June. A company in Toronto, Canada is representing the film for world release; no word yet on if that includes the USA. Triggerfish is the name of a successful animation production house in South Africa near Capetown. Originally founded by Jacquie Trowell and Emma Kaye in 1996 to produce short films and commercials, Triggerfish are celebrating their 15-year anniversary in 2011 by announcing two upcoming CGI animated films. The first out of the starting gate is Zambezia, slated for world-wide release this year. It’s the story of a young falcon named Kai, who seeks freedom from his over-bearing father by escaping to a legendary paradise of birds… where he soon discovers that paradise may be more complicated than he thought. Up next is Khumba, the story of a strange “half-zebra” who journeys across South Africa to “earn his stripes”. Triggerfish have the trailers for both these films on their web site (Triggerfish Animation), as well as show-reels for their many short works. 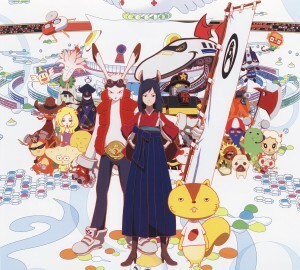 Summer Wars Comes To DVD… Here! In case it passed you by: Summer Wars is a very popular and successful Japanese anime feature film conceived by Mamoru Hosoda, written by Satoko Okudera, and directed by Hosoda. It was produced by Madhouse, and released in 2009 by Warner Brothers Pictures Japan. The basics of the story: Kenji Koiso is a shy and awkward high school math-wiz, employed part-time as a sysop for a massive virtual world game called “Oz”. The first problem — Kenji is falsely implicated in hacking the game. But then he and his friends stumble upon a much bigger conspiracy at work… and he, they, and all of their avatars must work together to keep the real and virtual worlds from colliding destructively! Why should Furry Fans care about this? Check out some of the avatars in the picture below! That’s why! The good news is that an English-language version of the film has been completed for Blu-Ray and DVD release. Funimation Entertainment will be bringing the DVD/Blu-Ray edition to North America on February 15th, and Manga Entertainment will be releasing it in the U.K. in March.